In case you were unsure, a humanoid robot resembles a human, however basic or abstract. Some have a torso with a head, two arms and two legs, and then there are those that might only have part of a body, say from the waist up, or only the face. There is also a humanoid robot with a ‘face’, ‘eyes’ and a ‘mouth’, and there are male and female ones: the males are called Androids and the females are known as Gynoids. Young children who are exposed to robot toys that have lights, play music and have sound effects can have their sensory skills enhanced. Even something as simple as pushing on the different interactive buttons can help children develop a sense of proprioception and spatial intelligence, while a robot that interacts and speaks to children helps them develop vocabulary and social skills. Even more exciting are the most recent studies that show how a humanoid robot is being used as a tool in therapy sessions for children with autism. There is a humanoid robot for children as young as six and seven, all the way to 106. And while some come in one piece, and others in pieces, they all come in peace. While this humanoid robot might not resemble the general appearance of the human body’s shape, it resembles mine and that’s why I’ve included it. I couldn’t resist this one, and although it’s not a true humanoid robot, he does display some human features. 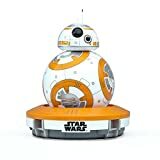 BB-8 is the newest robot companion and everyone adores this little guy. You can control his movements with a smartphone or tablet and he’ll also listen to and react to your voice. His behavior evolves as he spends more time with you. An added bonus is the ‘watch with me’ feature—watch Star Wars: The Force Awakens with him by setting him in his charging base and watch his reactions along with the movie. While some might not call MiP a humanoid robot, he is a really special little ‘bot that’s packed with loads of technology. He communicates through sound, motion and LED eyes, and he has the sweetest personality that is inquisitive and fun. 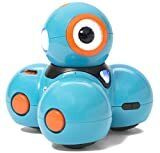 Ideal for kids as young as eight, he can navigate his way around his surroundings and he follows your hand gestures. This is one lovable humanoid robot who likes to spin-dance to music and he even expresses his emotions with shouts and groans. MiP has a free iOS and Android phone app and once it’s connected the fun really starts. He’ll even you bring refreshments on his tray. It’s my little boy’s birthday soon and guess what is on his gift list? His very own Meccanoid 2.0. 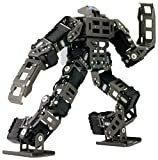 You get to build your own robot with high quality, durable pieces and real tools—all included in your set—who stands two feet tall, has six different motors for amazing movement, articulating arms and head as well as motorized feet. 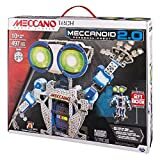 Not only do you build your own robot, you can program his LED eyes with over 500 colors and there are three innovative ways to program him including Learned Intelligent Movement, Ragdoll mode, and Drag and Drop programming. This is done through the Meccanoid app that can be downloaded to a smart device. He also knows more than 3000 pre-programmed phrases, can tell you stories and knows a whole lot of robot trivia. Designed by NASA engineers based on real-world robots, WowWee’s award-winning humanoid robot toy is a staggering 14 inches tall and comes to life using a remote control or via any iOS or Android device. Looking a little bit like a Star Wars storm trooper Robosapien X has two different types of hands; one with flat fingers and the other resembling a claw, which means he can pick up a variety of items. With real multi-speed, fast, dynamic walking, running and turning movements, Robosapien X has 67 preprogrammed routines and you can also program your own. Definitely, for older kids, the ROBOTIS GP Grand Prix is a top notch humanoid robot that is optimized for various robot competitions. With its gyro sensor, remote control, RoboPlus GUI programming software, Dynamixel AX-18A actuators, and ultra light aluminum frame construction, this is one heck of a robot. The Robotis is capable of a wide range of performances and using the RobotPlus software you are able to program even more. If you have a young hobbyist on your hands, this is the perfect humanoid robot for them, and it’s also suitable for competitive robot builders and even researchers. The Bioloid Premium Kit is for serious robot enthusiasts. It combines a flexible construction system with an Intelligent Micro Controller and Sensors that brings your creations to life. Its flexible design enables the construction of an unlimited number of robot shapes: so far there are 39 documented shapes that include simple wheeled robots all the way to advanced humanoids and even hexapods. At the moment this is probably the best humanoid robot on the market and you need to be aware that it’s not a toy. Although the manufacturer’s recommended age is 10 plus, I think this is for more advanced builders, and it’s going to take some skill, some time and a lot of patience. One of the sweetest humanoid robot toys for children ages 8 and older is none other than Dash. Even if he didn’t do a darn thing I would want one—he is just so cute—but he can do a heck of a lot. He can sense his environment, be programmed wirelessly and he can move, dance, make sounds, glow, and react to voice input; in fact, he can do anything you set your mind to. 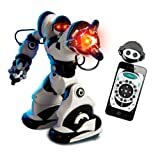 There are some awesome apps available for Dash on iOS and Android and if you’re wanting to introduce your children to technology and robots, this is the humanoid robot to do it with. So, what do you think? Can you see yourself adopting a new member into your family? They’ll do exactly what you want them to and will be such a good influence on your kids!